FREE WORKSHOP AT SMITH COLLEGE – Bring your instrument! Download handouts below. I was 23 the summer I fell into fiddling. Four contradances was enough to do it. I started sitting on the stage. Next thing you knew I was talking to the musicians. Word filtered back through them to the caller that I used to play. Then one day at the Concord Scout House “NEFFA on Sunday” dance, the caller walked up to me at the break with a fiddle under his arm. “Here,” he said, thrusting it into my hands. “Sit in the back. There’s music in the bag. Don’t mess with the beat.” It was 1972. The caller was Dudley Laufman, the fiddler was Allan Block and the pianist was Bob McQuillen. That was how I came to play with the Canterbury Country Dance Orchestra. Yup, there was music in the bag. Two huge LL Bean bags full. My sight-reading skills did not include reading sixteenth notes at 120 beats per minute, so I bought the LPs to listen to. Over and over and over. I bought three copies of each record. My Sears Silvertone record changer was primitive enough to allow me to slow the record down by almost half. With my thumb. Then I could record the resulting, octave lower output on my mono Sony tape recorder, my first ear training tool. Made the tunes sound a bit ‘wubba wubba’ but the rhythms popped out. Still, the fiddles were buried in the big band sound. The LPs only lasted awhile before I destroyed them with my primitive ‘learning by ear’ technology, laughable by today’s standards. And I still didn’t have the fiddle knack I was looking for. So, I began watching the fiddlers at the dance. Allan Block was the clear leader (he sat next to the piano, and had a microphone). After awhile, I stopped worrying about hitting every note on the page and began to play less and less, kind of trancing a little on the repetitive nature of both the dance and the tune. Must have been a modal tune, maybe Em/D, one of those where it’s easy to zone out. Next thing you know I’m copping Allan’s right hand movements and [hot DAMN!] sounding just the least little bit like him. Not all the notes, but the rhythms, and I’m dancing inside! Not long after, Allan took me under his wing and showed me the really cool basics (link to lesson #3) of bowing rhythms. Within a few years, I was “messing with the beat” in my own bands, a practice I honed and practiced by subdividing and syncopating dance phrases at thousands of contradances. Talk about altered states. To this day, my right hand groove owes a whole lot to Allan Block. 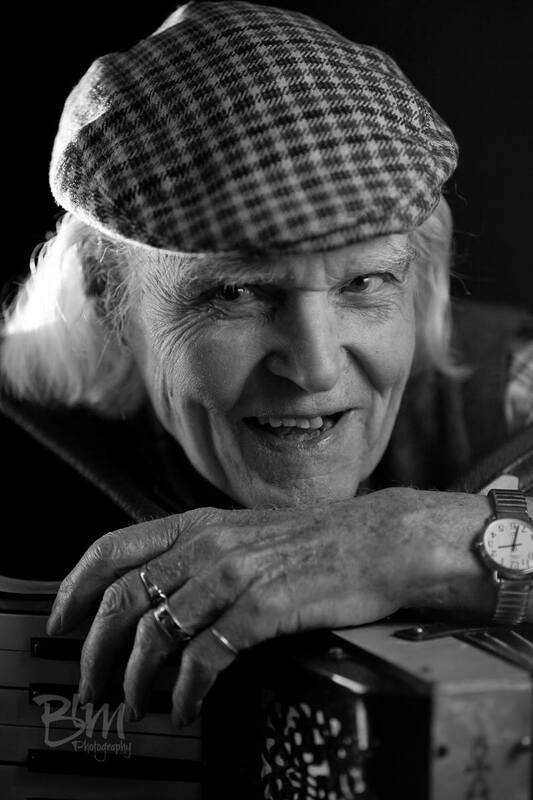 We lost Allan last year, and Bob McQuillen left us in February 2014. Big giant shoes to fill. 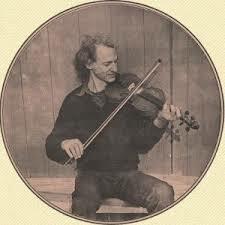 Bob was a prolific composer of fiddle tunes (more than 1500), all dedicated to friends. Perhaps his best-known tune is “Amelia,” a waltz in D major. Marching Down 5th Ave. is a Mixo pipe march in A that I wrote the week my daughter went off to live in an NYU dorm on 5th Ave. She called me every day walking up 5th Ave. to acting classes in Chelsea. The tune is played AABBCCDD. Rhythm players often leave the third out of chords behind ‘modal’ tunes, making the third even more bendable. 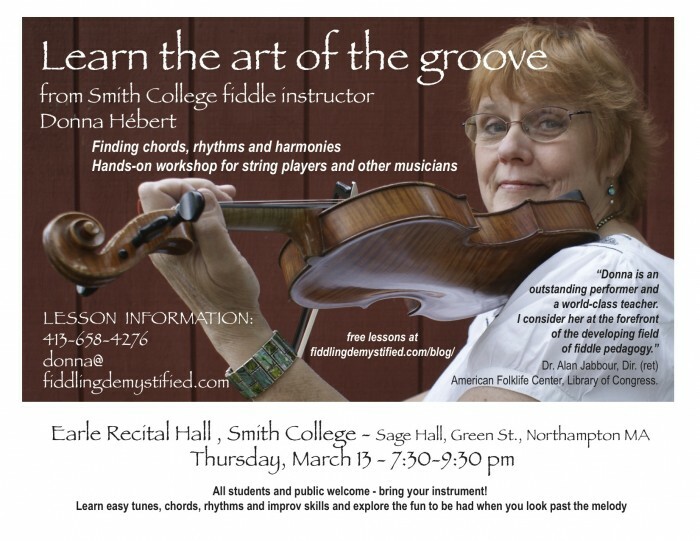 You can download the learning aids below for the workshop on March 13 at Smith College, where I teach fiddle instruction and performance. I was lucky. I could study Allan Block’s right hand from behind and intuit rhythms from his movements, all the while listening to Bob McQuillen’s rock-solid groove. This workshop format allows me to be the groove-master in the room. I can turn my back on the class, and instead of them trying to figure out what I’m doing while mirrored, participants can follow my actual movements and pick up the rhythms more easily. Wish you could all be there. It’s an honor to pass on the lore and the music of such great players.